The seventh volume in this series and this time our one hour long production includes Carlisle, Edinburgh, Glasgow Buchanan Street, Stirling, Thornton Junction and Perth before ending at Aberdeen. From Carlisle we travel to Edinburgh on the Warwickshire Railway Society’s three day epic tour in 1966. 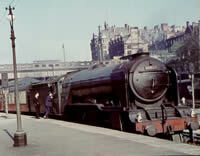 Steam action is seen a plenty at Waverley station, plus the diesel hauled Royal Train in September 1964. We spend time at St. Margaret’s shed as well as the new marshalling yards at Millerhill. The Railway Society of Scotland’s J36 tour takes us to Portobello, Musselburgh, Smeaton and Corstophine before we explore the former Caledonian Railway’s Princes Street station. Another new marshalling yard was built at Thorntom Junction where we see J37s, J38s, B1s and WD 2-8-0s all working on the then expanding coal traffic around Fife. Our journey then takes us to the “other” Forth Bridge at Throsk, near Alloa. A surprise for many enthusiasts was that the final home for Gresley’s A4 Pacifics was not the East Coast Main Line but on the 3-hour expresses from Glasgow to Aberdeen. By May 1964 all the remaining class members were allocated to Scottish Region sheds bar one, and they settled down to several good years of work on this route being quite at home on the tightly timed 3-hour expresses. We visit the Glasgow terminus of these 3-hour expresses at Buchanan Street before moving on to Stirling to watch the steam activity there including the last workings of Stanier’s Coronation class Pacifics. At Perth more steam action is seen at the station plus a visit to the shed. Our journey continues via Coupar Angus, Stonehaven and Cove Bay before concluding at Aberdeen. Here we see the joint station that opened in 1867 and then visit Ferryhill shed which was the home, in June 1965, of seven A4 Pacifics. All the archive film was filmed entirely in colour and mostly during the 1960s. An authentic soundtrack has been added along with an extensively researched commentary complementing this nostalgic look at the railways in Scotland. Cover photo:- Cover photo:- Keith Pirt/Courtesy Book Law Publications, “A2” Pacific No.60532 “Blue Peter” on an Aberdeen to Glasgow express. This volume features the well known scenic Highland lines in Scotland and includes many views of steam up until 1967 as well as some diesels in the 1960s-1980s. We open with a journey along the Highland main line, followed by railtour with a B1 along the Waverley Route to Hawick for scenes of a V2, A4s and Black 5s. At Gleneagles there are A4s on Glasgow to Aberdeen expresses followed by shed scenes at Polmadie including Britannias, Standard 5s, Standard 2-6-4Ts and a green Claydon! At Dunblane, we see A4s on passing expresses, before visiting the Callender and Oban line for a scenic trip using both steam and Type 2 diesels. Travelling past Doune, we visit Callender for a variety of station steam scenes, before going onward to Balquhidder, Lochearnhead, Killin Junction (with a view of the Killin branch train), Crianlarich Upper, Connel Ferry and Oban. There is much activity around the station, shed and harbour including Caley Tanks shunting the yards! 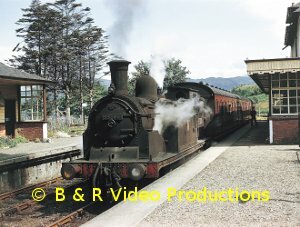 We return to Connel Ferry for rare footage of an Ivatt 2-6-0 hauled return trip along the Ballachullish branch travelling across the famous road-rail bridge and on to Creaghan, Appin, Kentallen and Ballachullish Ferry (for scenes of the ferry) before arriving at Ballachullish. On the West Highland line, we visit Tyndrum, Crianlarich, Rannoch and the old Fort William harbour station in the days of steam with ex-LNER/LMS engines. Next, a visit to the Mallaig branch in the 1960s for steam and early diesels as well as the later 1980s steam specials featuring ex-NBR 0-6-0 “Maude” and Black 5s. There are scenes at Glenfinnan Viaduct, Arisaig and Mallaig where we also see a lot of ferry activity in the harbour. Northwards to the Kyle of Lochalsh line, and views of the old Skye ferry in action at Kyle plus ships being loaded. Various station scenes include shunting with a Class 26 and service trains with Pullman observation coaches. We travel back along the line to Stromferry, Garve and Dingwall before visiting the Far North line with footage at Ivergordon, Golspie, Kildonan, Georgemas Junction and Thurso/Wick. 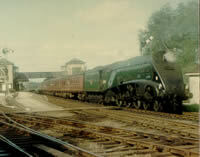 We finish with scenes at Perth, Stonehaven and Glasgow Buchanan Street including Green A4s “Bittern” and “Sir Nigel Gresley”. Jim Clemens Collection No.17. This is the second volume in a trilogy of videos on Scottish railways from the JIM CLEMENS archive collection and covers the eastern areas of the railways north of the border. EDINBURGH WAVERLEY using 1930′s film with a comparison to the 1960′s using a Deltic diesel. Visit ST.MARGARETS and DALRY ROAD sheds in Edinburgh before leaving on a 1963 railtour with North British No.256 and J36 and J37 types to QUEENSFERRY, THORNTON and ALLOA. There is a visit to FIFE for NCB workings at Dysart before leaving the eastern side of Scotland for the infamous Caledonian Railway Single No.123 1963 tour from Glasgow to CRIANLARICH in the snow. The Easter 1962 tours included rare visits to branches along the Strathmore route, LEYSMILL, COUPAR ANGUS and BANKFOOT with Caley motive power. The INVERBERVIE branch from MONTROSE, BRECHIN and the CARMYLLIE branch.The Highlands of Scotland feature with visits to INVERNESS, including it’s shed, from where a run with Highland Railway 4-6-0 No.103 travels via ELGIN to INVERURIE. Finally steam at PERTH and STIRLING and a trip on the Thames-Clyde Express out of St ENOCH to Carlisle. Here there is a look at KINGMOOR with Duchess locos. Filmed in colour from 1962 to 1966 but some black and white footage from 1930 and 1959 is included. A detailed commentary and authentic soundtrack completes a nostalgic look at Scottish steam. Jim Clemens Collection No.13. The first in three volumes to be released of Jim’s visits to Scotland over the years 1959 to 1967. This video covers the West side of Scotland from Carlisle to Mallaig. The WCML north of Carlisle included the climb of Beattock and the junction at Carstairs. Rarely visited lines here, remember Catrine and Alton Heights Junction? East Kilbride leads on to Gourrock and the Clyde. Glasgow sheds like Polmadie, Hurlford and Motherwell. The City’s trams and trolleybuses and west coast steamers. Glasgow Queen Street to Fort William with 256 and a J37 double heading. Then Mallaig with two J37’s in 1963. There is a wealth of archive film here. A general look at the railways of Scotland from 1960 to 1966, from Ayr to Wick and Mallaig in the west. Beginning with the Caley single No.123 we move on to see the route from Perth to Aberdeen with A4 and V2 classes. A look at South West Scotland around Ayr, and Carlisle with Crab, Black 5, Standards, a Princess Royal and Caledonian 0-6-0 tanks. A tour of Glasgow sheds in 1960, infinite variety here. The Killin branch and Ballachulish with steam, and on to Fort William and Mallaig with K1, K2, and J36. The Far North line with steam at Inverness and early diesels to Wick and Thurso although a Pickersgill 3F 4-4-0 appears at Thurso. South to Perth via Inverurie and Craigellachie for more steam at Gleneagles and Stirling. Via Kinross to the Forth Bridge brings us to Edinburgh Waverley when A3′s still had the “Queen of Scots” Pullman. Finally, No.123 again on that infamous Scottish Rambler tour of Easter 1963 from Dunblane to Crianlarich via Killin when it snowed! Of all this will the steam railways of Scotland be remembered.